Inanity aside, glad you guys like it. The next game is pretty much finished, aside from some graphics and animation. A G-G-Ghost! is out now! Well, as was mentioned, a lot of items just don't give any information when using one of the 'actions' on them. So just add some extra information (or only show the 'actions' you can perform on the item)..
also a bit of extra sound/music would be nice... but anyway, looking forward to your next game.. This game was great. I throughly enjoyed every bit of it. hot damn sir, very nice work! The game seems interesting, but I seem to be having problems with it. Am I the only one? The cursor seems to have a boundary to prevent it from leaving the 'playing area' of the screen. Which is very odd since you have a drop down GUI on the top that can't be accessed unless I ram the mouse as fast as I can towards the top of the screen to make it past the bounding rectangle. I can't use the GUI Coin on inventory items unless I HOLD the mouse button down, even after it appears, to reach the GUI Coin. But it works the way it should while you're outside the inventory GUI. You can release the mouse after the Coin shows up, and click on either of the interaction. It shouldn't work both ways in gameplay, if it won't work both ways in the inventory. I am also quite lost on what to do. Probably due to there being almost zero responses to interactions (which has already been brought to your attention from other comments). I picked up the green marker. Tried picking up the fairy statue, but the dead girl in the mirror told me she'd eat my soul. I realized she is missing eyes, and so is the stick figure in the drawing on the floor. So I'm assuming I have to draw eyes on the stick figure and she'd suddenly have eyes as well. There isn't any comment while I use the marker with the drawing, and there definitely should be. So because of that reason, and the programming complications (mouse boundary, and Interaction Coin in inventory), and the lack of responses, I gave up on the game. It seems very interesting. It's kinda funny. Just wish it didn't have these issues. I'm hoping that you will run through the game's script once more, adding more interactions and such. Fix the issues I mentioned. And release a new version. I will definitely play it. Use the knife on the soap to cut a figurine and replace it with the fairy. And I just replayed it, you're right. The top menu is hard to reach as if the mouse won't go there. But since it's only load/save/quit you can do that with F5/F7/CRTL-Q as well so not too much worries there. And keeping the mouse down to pop up the verbcoin is quite normal. Nothing strange there (imo). It's the lack of interaction that makes it weird sometimes (like with the drawing). And keeping the mouse down to pop up the verbcoin is quite normal. Nothing strange there (imo). I didn't mean that holding the mouse was the odd part. I'm aware that most games require you to hold the mouse down to pop up the VerbCoin. Although, the AGS VerbCoin template requires you to hold the mouse down for a very long time. Feels like 2 seconds. It's a real nuisance. Should only be 1 second at the very most. Deleted my previous message because I realized I was wrong. Oh my, I just played the game again and realized I made a mistake. I could have sworn I was releasing the mouse until the GUI popped up, then click on the action. I guess I wasn't. But if you push the mouse over the GUI, it closes (but whatever action you rolled it over, will be selected). THAT was my issue. I apologize for the error. But since it's only load/save/quit you can do that with F5/F7/CRTL-Q as well so not too much worries there. Now you're making it seem like it's okay that he has a mouse boundary preventing the player from reaching the GUI. It's still a problem. How many random people actually know the F5/F7 shortcuts to save/load? Even CTRL-Q to Quit is very random. Either way, the game shouldn't have had a VerbCoin with the amount of verbal interactions that were present. One mouse button to interact and one to look and/or walk. Anyway, sorry for dumping all these game-play criticisms at you. The game seems like a very good game. Nice graphics. Good dialogue. It just needed a few Beta testers, not just yourself, to tell you what they had problems with, and what should have been fixed. I wouldn't be putting up this much of a stink if I didn't think the game deserved better. Hi guys! It's been a minute. How're you? 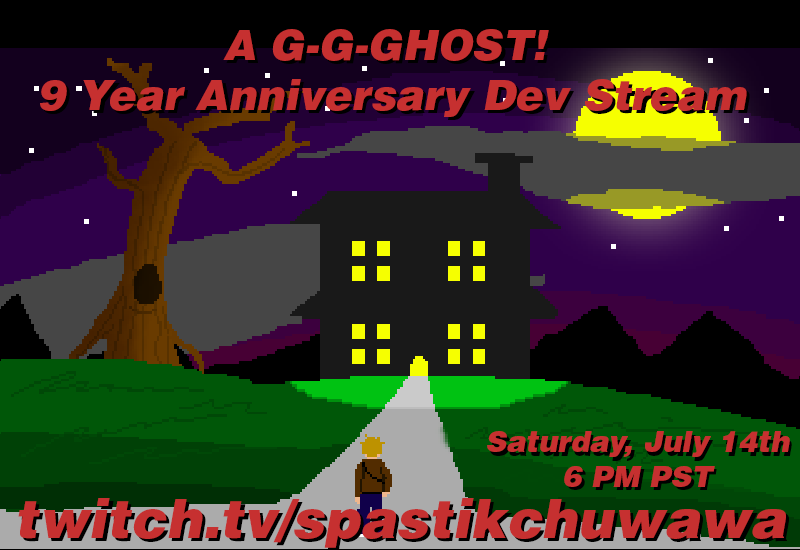 This Saturday is the 9 year anniversary of my first game, and I thought it'd be fun to do a stream where I play through the whole thing and cringe at all the mistakes I made while designing it! Should be a romp. This is all from before my time but I just wanted to say that I'm going to play this game! It looks awesome! And quite the original idea to replay your own game 9 years later. I hope you also put it up on youtube. I want to watch after I've had time to playthe game first! I'm definitely planning on posting it to my YouTube channel and archiving it on Twitch. I uploaded the game to itch.io to make it more easily available. I just played this game for the first time, actually—I believe I had had trouble getting it to work on an earlier computer way back in the day or something, I’m not sure. But I noticed it again with your post yesterday, so I was finally able to download it today. I don’t know what I was expecting, but it was actually witty and quite fun to play—I enjoyed it quite a bit, more than I even thought I would. A nice way to spend 30 minutes or so before I had to get back to the usual hum-drum of the day. Thanks for re-sharing. Thanks Sarah! It's pretty rough, but I learned a lot making it. Seems like a nicely done game, haven't been able to complete it as of yet. I just wanted to mention a strange thing I noticed - the musics are ripped off from the LucasArts Games game called "The Dig". As I love that game's extraordinary musics, it feels a bit cheap to have them ripped off for an AGS game. Couldn't the author have played some chords themselves and recorded that instead? It feels a bit 'off', when I am playing a ghost manor game and keep being reminded of the otherworldly environments of The Dig. It takes the player out of the game, so to say. Plus, it's a bad form to rip off other people's musics anyway (though I am a bit guilty of the same sound-effect-wise, and design-wise - my game has 'visual copies' of someone else's creations, but at least I pixelled them in higher resolution by myself instead of just blatantly ripping them off). The walking animation looks a bit weird, the foot raises a bit too much, perhaps. The grey, black-outlined text on a white background is also unclear and hard to read, I recommend never to use white background when it comes to computers, as white is the brightest color, and thus it's like a lamp shoved up your face. White is good for paper, but not for computer monitors, as monitor consists of light, so white is like the brightest light the monitor can output. The graphics seem a bit simplistic and cartoony, there's not much depth or dimension about them, but it kind of fits this type of game, I suppose. The 'interactions' thing that many people have mentioned, is indeed the core of adventure games in my opinion, so I tried to put at least some of those in my game, and it would've been more fun to be able to get more remarks and manipulate the objects further. You game is competently scripted, though, unlike mine, hehe. There's also a weird 'bug' (?) - every time you go from one room to another, there's garbage on the screen before the new room appears. In any case, it's a cool game, I'll go back to try to solve it, and then maybe I can write a better review. Thank you for the great review, Teikatu. I totally agree on the music, I was pretty shameless about ripping music for things back then (it was especially bad in my YouTube animations), definitely something I wouldn't do nowadays.